Apparently, I’m not the only avocado-lover out there. In the United States, per capita consumption of fresh avocados climbed from just over two pounds in 2000 to seven pounds in 2015. Fresh avocado has become so popular that some emergency rooms have reported an epidemic of serious hand-cuts from improperly slicing through the pebbly green skin. “Avocado hand,” they call it. The best way to avoid injury is to put the big berry down on a flat surface to cut it open. Of course, it also helps to use the right tool. A number of avocado-related kitchen tools and gadgets are on the market. They can make life with avocados safer, tastier, and generally more convenient. Of the three gadgets, this multi-tool by OXO has proven to be the most useful. It’s three functions are splitting the avocado, removing the big pit, and scooping out / slicing the creamy green goodness. To be honest, I don’t use the pit-removal tool. Usually, I wait until the avocado is ripe before I open it, and the pit almost falls out on its own or can be gently pried out. But the other two components I use a lot. The plastic blade safely cuts open the fruit, with minimal risk of Avocado Hand, and tool on the other end is great for digging out the flesh in neat slices. The grip is, indeed, good. Sure, it was easy enough to cut open my avocados with an ordinary table-knife. I never cut myself. However, I do enjoy using the Good Grips 3-in-1, especially the scooping tool. I’d give this gadget 4.5 out of 5 stars. The container has a sliding bottom that allows you to press out all the air after putting in the guac and securing the lid. Then you just close the small top hole with the stopper that’s on the hinged flap. With the air gone, the guac keeps for several days without browning. So far, my record is three full days. The guac might have kept longer, but I couldn’t wait. Clean up is a little complicated. My rating is 4.5 out of 5 stars. The Avo Saver by Evriholder is the only one of the avocado gadgets I’ve been disappointed by. The concept is simple, and serves a need, which is to keep half of an avocado fresh. I have used plastic wrap or aluminum foil for this purpose in the past, tightly wrapped, but even after less than a day in the fridge, the cut avocado would be turning brown. I had high hopes for this avocado gadget. You just place the avocado half with the pit face down on the slick plastic surface, and then strap it in. According to the blurb on the packaging, the Avo Saver “reduces a cut avocado’s exposure to air, slowing its oxidation.” I’ll grant that it slows oxidation compared to, say, not doing anything at all to cover the open half. But I’ve seen as much browning in a day with the Avo Saver as with plastic wrap or foil, maybe a little more. The main advantage of the Avo Saver is that it can be re-used many times. 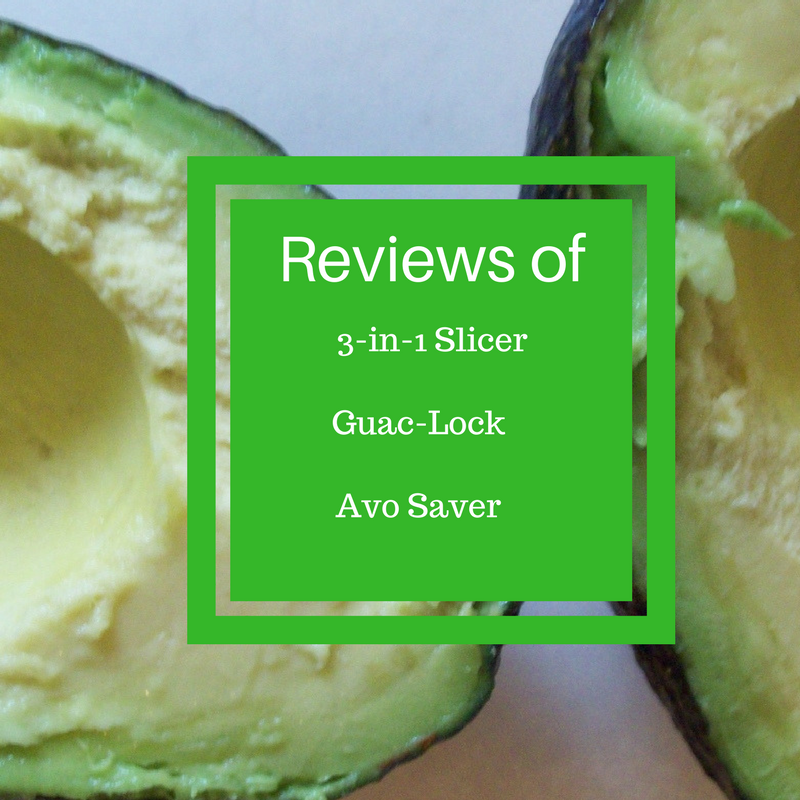 My rating for the Avo Saver is 3.5 out of 5 stars. My ultimate solution to the browning problem is to buy smallish avocados. Then I can eat a whole one upon first opening it. The other option is to just make guacamole.